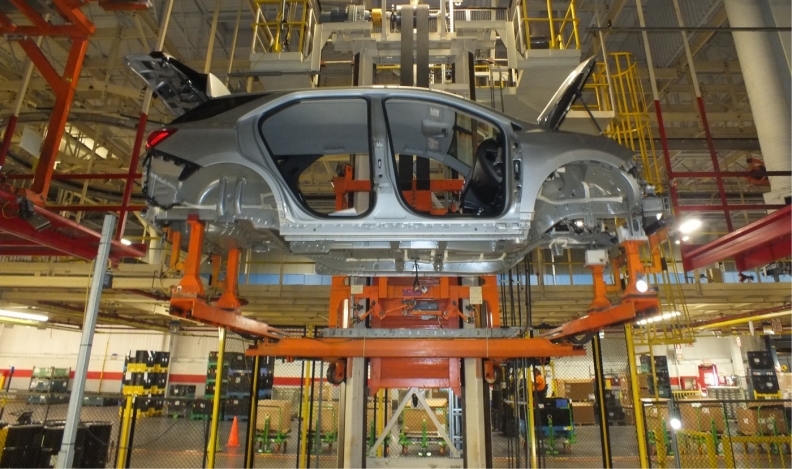 A Chevrolet Equinox, popular in the United States, moves down an assembly line in Ingersoll, Ont. Even with hopeful signs on NAFTA and a trade detente between the United States and the European Union, Canada still isn’t out of the woods when it comes to auto tariffs. U.S. Trade Representative Robert Lighthizer said Thursday he hopes a deal in principle on the North American Free Trade Agreement is within reach, a day after Canadian and Mexican ministers indicated a pact could be signed in the next few months. U.S. President Donald Trump and European Commission President Jean-Claude Juncker also agreed Wednesday to suspend new levies while trade negotiations continue. But Canadians shouldn’t breathe a sigh of relief just yet, according to Dan Ciuriak, senior fellow at the Centre for International Governance Innovation. The latest moves by the Trump administration are tactics designed to shore up the president’s base ahead of midterm elections, he said, and nothing has changed on the U.S. inquiry into whether imported light-duty vehicles constitute a national security threat, known as a Section 232 investigation. As part of the trade wars Trump is fighting around the world, his administration is said to be considering tariffs as high as 25 per cent on imported vehicles and components. Companies from General Motors in the United States, to Nissan in Japan and Daimler AG in Germany are already blaming the escalating battle for disappointing results. The imposition of tariffs “has the potential to be really devastating for the global economy,” Prime Minister Justin Trudeau’s top diplomat said Wednesday in Mexico. Canadian Foreign Affairs Minister Chrystia Freeland spoke to reporters around the time the U.S.-EU agreement was announced, and said in response to several questions she hadn’t seen the details, but that “any act taken by the U.S. administration to pull back from imposing these 232 tariffs I think is a really good thing.” However she gave no indication Canada would be offered a reprieve. Trump’s threat hangs heavy over the Canadian economy. The auto sector accounted for almost a fifth of Canada’s bilateral trade in 2017, according to Brian DePratto, senior economist at Toronto-Dominion Bank, who estimates tariffs of 25 per cent on motor vehicles and 10 per cent on parts would cause a minor recession in Canada in the second half of 2019 and lead to the loss of about 160,000 jobs, mostly in Ontario. There’s been speculation Trump’s tariff push is partly designed to earn him concessions at the NAFTA bargaining table, where sticking points — including a “sunset clause” that would see the deal revisited every five years and proposals on restructuring the auto sector — remain barriers to wrapping up a new agreement. And after a two-month lull, there is sudden movement in talks to overhaul the 24-year-old pact. Trudeau’s team hasn’t compromised on the sunset clause, and Freeland said Wednesday the country’s opposition to that proposal has increased because it would interfere with automakers’ long-term investment plans. Ciuriak doesn’t buy the idea a quick deal is at hand. “To my knowledge there’s been no pullback on the poison pill issues,” he said, adding there’s a 50-50 chance the United States proceeds with auto tariffs before the November mid-term elections. Derek Holt, senior economist at Bank of Nova Scotia, argues the only reason Trump appeared to backpedal with the EU is because of domestic pressure. “An alternative explanation of Trump’s sudden about-face on auto tariffs is that he knew he’d lost the battle domestically, or at least he was probably being told as much,” Holt wrote Thursday in a note to clients. An agreement on autos could nevertheless unlock the stalemate between Canada and the United States, according to Jean Charest, former Quebec premier and now a Montreal-based partner at McCarthy Tetrault LLP. “For Donald Trump, it’s first and foremost about the automotive industry,” Charest told BNN Bloomberg on Thursday.